Join us for a tour of Berlin to catch a glimpse of all the must-see sites and visit the city's Christmas market. In the afternoon, join us for a tour of Cecilienhof Palace. After the end of World War II in Europe, the Potsdam Conference - attended by Stalin, Churchill and Truman - was held in the palace. We'll spend the morning cruising the river. This afternoon, take a guided tour of Magdeburg. Enjoy some free time on your own at the local Christmas market before returning to the ship. Join us for a visit of Lutherstadt Wittenberg. We'll discover the city center and its noble Renaissance-style houses. We'll return to the ship, and the afternoon will be spent cruising to Meissen. Tonight will be our gala dinner and evening. Our ship will cruise through the night. 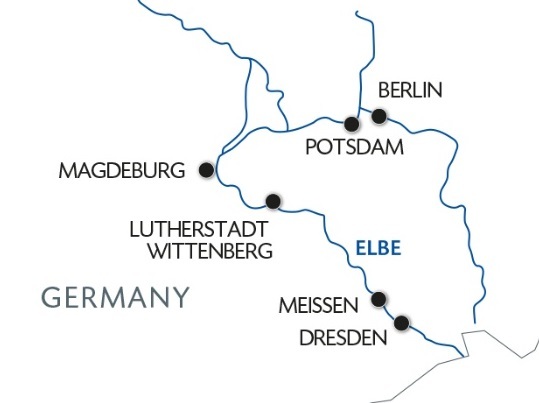 We'll leave on a guided tour of Meissen, famous for its trademark porcelain. We'll then spend some time browsing the magnificent Christmas market in the old town. We'll return to the ship and spend the afternoon cruising to Dresden. This evening, revel in our festive Christmas Eve dinner on board. Midnight Mass will be celebrated in Dresden(1-2). Christmas day services will take place at the Dresden Frauenkirche for those who would like to attend. The afternoon will be dedicated to a tour of Dresden on foot. Tonight, we'll enjoy a symphony of the music of Johann Sebastian Bach at the Dresden Frauenkirche.